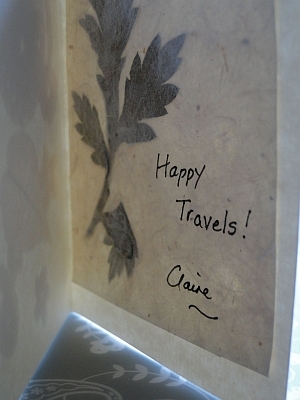 My first adventure into the land of crochet cards involved a Bon Voyage card for a friend. I found some of my appliqués and leaves from some hand made paper, and dug out some glue. As the theme was travel, I used the Penny Farthing Appliqué and the Crochet Bike patterns, as well as some Five Petal Flowers. So I arranged my flowers, bikes and leaves and then stuck them on the card. 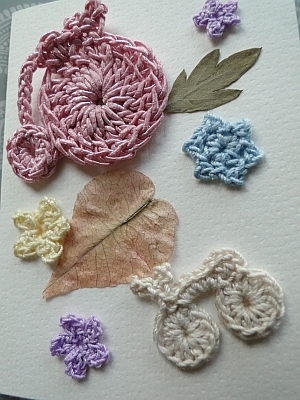 I chose to add another leaf from my paper, rather than add more crochet, as the card might not have closed properly. Then a short message, my name, and the card was done! I'm looking forward to making some more cards soon, and when I do, I'll add them to this page.